Fortnite may be free-to-play, but it’s such a big phenomenon that it will benefit from having a store presence this holiday. 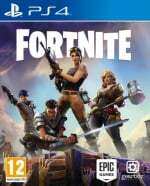 Epic Games has partnered with Warner Bros to make that a reality, announcing that the complimentary title will make it into stores on the PlayStation 4 from 13th November. But how, we hear you ask, do you sell a free-to-play game physically? Well, you bundle in goodies. This is technically titled the Deep Freeze Bundle, and it includes a Frostbite Outfit, a winter-themed glider, some ‘Back Bling’, and 1,000 V-Bucks – which just so happens to be enough for the title’s Battle Pass. The package will be available digitally as well, and will sell for $29.99 in the United States. And the purpose of this is....advertising? Save a couple of gigs in downloading the game? @NintendoFan4Lyf it will fly off the shelves tbh. @kyleforrester87 You are probably right. It guess it’s something more impressive to open on Christmas morning than a digital store card - everyone is looking to create next “Nintendo 64 kid” moment for YouTube. @NintendoFan4Lyf Not everyone is savvy. Having it in stores means that clerks have something to sell when Grandma goes to Gamestop and asks for "the Fortnite game". I will literally cut a hole in my stocking if Santa leaves this in it. So Fortnite can get stuffed? Result. 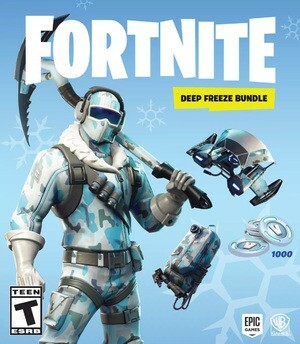 It is a decent skin plus your getting the pick axe and glider. With the 1000 vbucks Its a great present for someone who enjoys fortnite. Its not bad value for everything you get. The one game that will compete with Red Dead 2. If 1000 v-bucks is supposed to be for the Battle pass then why not just make the boxed version the battle pass version? Anyway, I'm glad this is releasing on PS4 so I didn't have to post a comment about the Switch tax as I think both versions are the same price. @ger2sammyb Any idea if anything is on the disc or it's all a download unlock jey? Speaking about selling there is a big VR Celebration sale on the NA PSN store. @FullbringIchigo That'll take care of itself when I cut a hole in the stocking. It'll fall right out into the fireplace. I bet it's a digital key in a box what a waste of plastic and paper but you'd think it be ok disc with the latest patched version at time of disc print. Anyway I've never been interested in this game go over to GameSpot and Jesus that site is obviously sponsoring it because the amount of news threads this game has is stupid why I stopped reading there tat years ago. @hotukdeals Thanks for your comment. It's become so fashionable of late to bash Fortnite with snarky comments (something I'm more than guilty of) but popular things are popular for a reason, and so anything that helps put this release into context and gives people an idea of its value is really helpful for those clicking on this article with genuine curiosity. Still wouldn't touch it with a bargepole, but that's just me. @jswhitfield8 With all the Taco Bell ads Sony runs they should make their blu rays taste like fire sauce. Ooh, VR taco eating contest game. Oops, wrong thread.